This simple crisp is a sweet comfort treat for breakfast, snack time, or dessert. Because our farm is located several miles past the last mailbox on the local delivery route, the U.S. postal service won't come out this far. Instead, they provide us with a post office box in town at no charge. 'Town' is ten miles away and consists of a church, a tiny post office—where you can only collect the mail in your box when the office is actually open for business—and a general store where the gas is full serve and you pay with cash or put it on a tab. The small, dark store, which is freezing in winter and a stuffy furnace in summer, has three chairs lined up just inside the heavy white front door (that jingles each time it opens), allowing whoever is sitting around shooting the bull an excellent view of everyone coming and going. If the owner is in the back slicing up deli meat or making a sandwich or out front pumping gas, the area next to the cash register quickly fills with patiently waiting customers. Over in the grass by the ancient off-road diesel pump there are stacks of painted metal farm gates and corral panels for sale, and on the other side of the post office there's a narrow, low slung building that used to be a bar (the sign still hangs above the door) that is now filled with rows of 50-pound sacks of feed and salt blocks. There's also a pool table, a juke box, and an old sofa in there, though I never see anyone using them, probably because the place is always kept locked during the day. Apparently there's a high threat of local feed thieves around here. The dusty aisles of the store offer everything from mouse traps to movies for rent, and although the official name of the place includes the word 'grocery,' the foodstuffs available mostly comprise a wide variety of junk foods. But there are usually a few cartons of somebody's extra backyard chicken eggs for sale, and once in a while you can find a brown paper bag filled with fat heads of locally grown organic garlic tucked between the candy bars and Little Debbie cakes. And if you're really lucky, up in the glass front refrigerator case by the door you'll spot a few wooden cartons of wild blackberries stashed among the Mountain Dew and Yoohoo chocolate sodas, picked that morning by one of the local Amish girls and selling for $2.50 apiece. During three rare trips into town during the same week, I bought 11 quarts. By the third visit, I hadn't even climbed out of our truck before the grandkids of the owner were running out of the store yelling, "Do you need some blackberries today?" I can be such an easy sell. Fruit crisps give you back so much more than you put into them. They require less effort than a pie but are usually met with just as much enthusiasm. We enjoy ours morning, noon, and night, and I don't make them nearly often enough. This topping is adapted from my Easy Autumn Pear and Apple Crisp recipe. If you prefer, you can make it with just whole wheat flour or just all-purpose flour. I tossed the blackberries with organic turbinado sugar (also called raw sugar), which I'm finding bakes up just as nicely as regular granulated, like in these Midnight Cry Mocha Brownies. All sorts of organic sugars, including even brown sugar, are thankfully becoming mainstream. As always, I urge you to seek out local and organic ingredients; they really do make a difference. Local Harvest is a fantastic resource for locating all kinds of healthy food grown close to home. Place the blackberries in a large bowl and use a large spoon to toss them with the sugar, flour (use 2 Tablespoons if your berries are really juicy), and cinnamon. Sprinkle the almond extract over the berries and toss well. Pour the fruit into an 8-inch square baking dish and cover evenly with the topping. Bake for 35 minutes, or until the topping is brown and the fruit is bubbling. Serve warm or at room temperature, with vanilla ice cream or freshly whipped cream if desired. This crisp will keep for 3 days in a cool pantry or the refrigerator. It also freezes well. I usually freeze one or two servings in containers (I use this Pyrex 14-piece storage set so much I bought a second one), but you could probably freeze the whole crisp; either leave it right in the pan (if it's freezer safe), or line the pan with heavy foil before baking, freeze the crisp in the pan, then lift the whole thing out of the pan in one big piece and transfer it to a container or zipper freezer bag. Set it back in the pan when you defrost it. © FarmgirlFare.com, where we're headed to a town meeting tonight to see if we can keep our little post office—which is on the list with over 3,000 others across the country—from being shut down. Our chances don't look good, but we have our hooves, paws, and fingers crossed. Oh, My - this looks heavenly. I made a blackberry cobbler that was more pastry than blackberry and it was fabulous, so this will be a nice addition to the "mostly fruit" dessert category. I gotta get my hands on a ice cream maker so I can make it to order - so much yummier than anything store bought! What a great description of your local fare. And I can't wait to try the blueberry crisp. I better hurry, though, because I just heard on the national news that most of the blueberry harvest in New Jersey was lost to Hurricane Irene's aftermath flooding. Looks yummy! I would be buying the blackberries on every trip to town too! :) Good luck with the post office! I want to move to your area - it sounds wonderful! The demerit of crisps, cobblers, and the like in my life is their poor portability. My baked goods generally have to travel. But I love them for their ooziness and crunch (and ease), so it's sad not to have more uses for them. Yum! Fruit crisp is wonderful. ooh, looks fresh and fabulous!! Oh Yum!! This looks like the perfect definition of 'summer in a bowl' (or 'pan' as the case may be). Good luck with the Post Office issue. If this doesn't work out, how far will you have to go to find a P.O.? I really hope you can keep your post office!!! I will be thinking about you and the others that could be affected by this. Love your blog, take care out there. Beautiful! That's our favorite way to eat our blackberries - easier than pie and just (if not more) delicious. Though I really need to make ice cream. 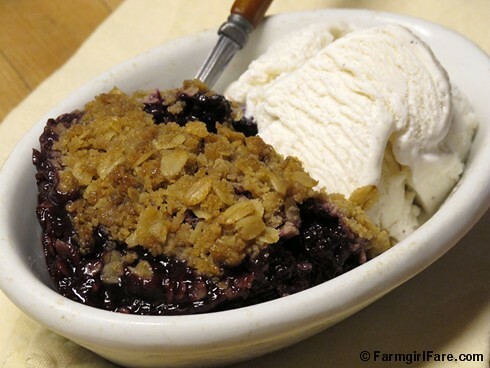 The a la mode-ness really makes a blackberry crisp sing. I'm in love with the blackberry crisp and would like to freeze it. I'm not sure, though, if you baked it first and then froze it or do you freeze it, thaw it, then bake it? Love you site and thanks so much for a great crisp recipe! Ahhhlmond extract, mmmmm. It's amazing what a little almond extract does in fruit dishes. 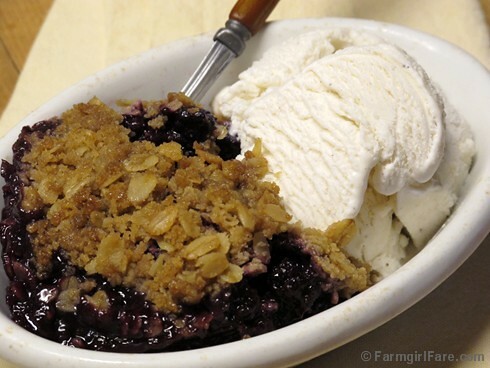 You had me at the Blackberry Crisp, but the almond extract brought me to my knees. ;) Well, not really. That would hurt. But it moved this right up the to-bake list for me, just as soon as my berries are ready. Thanks! Cannot wait for my Doyle Thornless blackberries to ripen. I make crisp every summer but never tried almond extract. Thanks for sharing this recipe! No blackberries here in London yet. I guess this would this work for other crisps - like apples? In England blackberries and apples are often combined in a crisp or pie. Yep! This topping is adapted from my Old-Fashioned Pear and Apple Crisp Recipe. Blackberries and apples together sound great! any recipes for peaches..ie peach cobbler? I'm thinking of trying peaches instead of the blackberries in the crisp recipe...whadaya think?